ATLANTA--(BUSINESS WIRE)--Businesses looking for quicker, lower-cost access to financing have an ally in Atlanta-based FINSYNC, and its network of bank, credit union and lending partners. Most businesses struggle to manage and forecast cash flow, an issue magnified when leverage (business financing) is applied to the business. 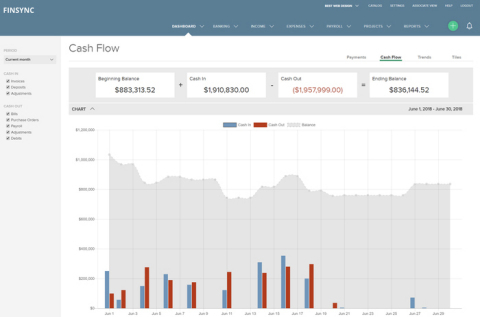 By contrast, businesses using FINSYNC to manage cash flow have a powerful dashboard that helps them centralize control of payments and gain an actionable, calendar view of projected payments. “We are excited about this milestone and what it means for small business owners trying to seize timely opportunities to grow or for those who can simply take comfort knowing capital is there when needed most. Through FINSYNC, a positive payments history is rewarded with fast, on demand access to capital for inventory, equipment, repairs, or just to make payroll,” says Tucker Mathis, CEO of FINSYNC. Near term enhancements to the FINSYNC user experience include expanding the system’s business owner training capabilities. As a business owner uses the system, it teaches them what metrics they need to track and improve in order to manage cash flow effectively and gain access to growth capital. FINSYNC is an all-in-one payments platform that helps businesses centralize control of cash flow, automate accounting and grow. In a single platform, businesses can collect income, pay bills, process payroll and leverage FINSYNC’s network of lending partners to access capital on demand. Businesses benefit with improved operational efficiency, lower operating costs and quicker access to growth capital. FINSYNC announces $1 billion committed to improve the way businesses finance growth.